Key Takeaway: Purpose is a journey, but you can take the first step very easily, right now! Open yourself up and love: practicing mindful awareness and proactive service in response to said awareness. And just as importantly, know and love thyself. It’s the key to discovering what the Daily You is all about. No, this is not an April Fools’ post, unlike the one last year. In fact, it’s quite the opposite: it’s more “serious” than humorous – but serious doesn’t have to be boring. In fact, it can and should be fun. 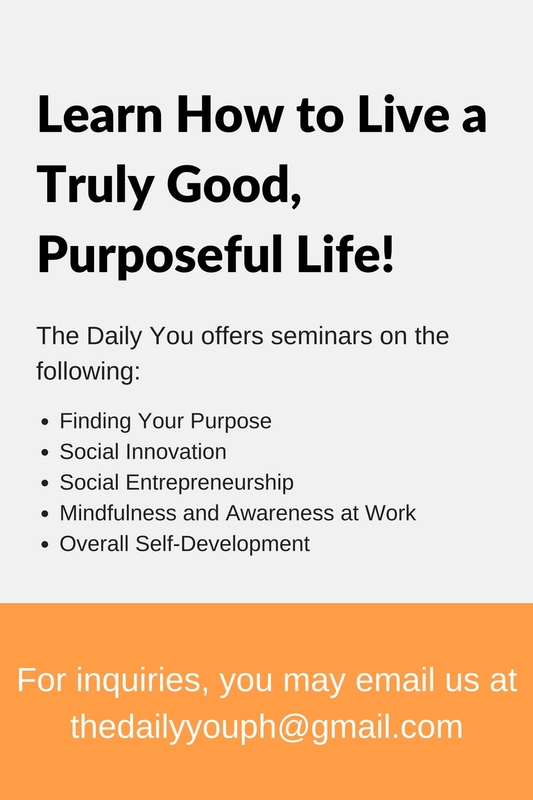 First of all, we need to review why purpose is important before we start finding it – you wouldn’t dream of investing yourself in something you didn’t feel was important, right? Somewhere, somewhen, somehow, we will each have to face the question of the meaning of our own life. Not just of life or existence itself, but how it affects each of us. To bravely answer that question, and to actually live it out, is living your purpose. To dodge it until the day you die is, well, going to be an unhappy experience. Here’s the thing: purpose can be misguided. Anything of worth that isn’t kept in check can be misguided. A good example is echinacea: It has many health benefits, but taken excessively, those benefits can become curses. Or even money: Being rich is a good thing, but if it becomes the center of your life, then it becomes the “root of all evil”. So purpose has to be rooted – rooted in love. And that’s how you start finding it. Love really is a many-splendored thing. It can be the most powerful single driving force on earth for positive change – if we come to know it well and know how to harness its power. Love, in this regard, is much more than just romantic: it’s relational. The way we interact with others – be it living things or otherwise – determines the quality of that love. The level of mindfulness to the other’s well-being and welfare (without necessarily at the expense of our own) as well as the level of proactive action to said mindfulness – that’s how true love is defined. In other words, purpose is lived through love, and is rooted in awareness and service. Put together, awareness and service make up love: they are two sides of the same coin that is love. And, when you love, you find a reason to live: you find a meaning for it all. You find a purpose. It’s a virtuous cycle. But we also need to learn to love ourselves. To be aware about ourselves. To understand that it is toxic and unhealthy if supposedly purposeful living comes at our own expense. It’s one thing to be selfish, it’s another, far nobler, thing to be conscious about yourself. After all, you’re the one living your purpose. Without a complete appreciation of yourself, it’s going to be impossible to live the Daily You. Purpose also usually (though not exclusively) takes time to discover. It’s a lifelong process, a journey of your living. It cannot be forced out of you – or it would not be true purpose. It takes inspiration. Some of us discover it earlier than those around us, while others might be late bloomers. The important thing is to know yourself, and to embrace it when that time comes. So, in a nutshell, how do you find your purpose? First, you learn to love yourself and others and the world around you. Do it by opening up, by reaching out, by practicing how to become more aware of your words, thoughts, and deeds – how they impact the people and environment around you as well as yourself. In the process, you’ll discover and learn more about that world around you as well as yourself. Shaped by your Life Kit – your own set of circumstances, gifts, abilities, passions, the things that make up your life – you’ll gradually figure out what you’re meant to do. Just be open to learning – learning of a different kind, not academic but of life. Tags: Awareness, higher purpose, love, mindfulness, Purpose, self-discovery, Service, The Daily You. Bookmark the permalink. Previous post ← Lady, you are worth it!